A bit of my reading in the last few weeks has fallen through the cracks. I’m doing a little housekeeping today, and along with the dust bunnies dragged from beneath the fridge and Dorito fragments coaxed out of the carpet, I found a couple of books that deserve a mention here. 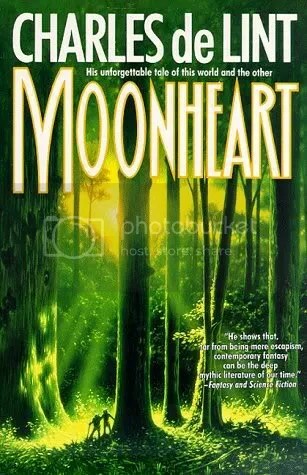 Back in February, in the midst of the sudden resurrection of my interest in faeries, I followed a tip from Caroline and went traipsing about in the world of Charles de Lint, via Moonheart. Here we find the usual epic struggle between good and evil, with sorcerers attempting to fight off ancient wraths and the Canadian Mounties attempting to keep a lid on increasingly odd deaths and destructions… While the nearly sentient Tamson House is the most compelling character, there are a few other interesting details too. 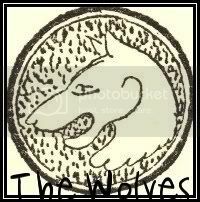 I enjoyed the mix of Celtic bardic magic and Native American(ish) shaman powers. The novel is full of problems though – the complex story suffers from bad pacing, with intense periods of action separated by chunks of exposition and descriptions of settings that don’t have enough going for them stylistically to make up for the disruption in the flow of the story. The large cast of characters were tolerably well drafted, but I didn’t find myself rooting for anyone and by the end of the book even characters I liked were starting to get annoying. This is only de Lint’s second book, and to all reports he got better from here so this may not be the end of my venture into his world. But my interest in faeries has been effectively quenched for the time being. Not long ago I found an odd sentence leaving my mouth – “I just read a really cute book by Virginia Woolf!” Flush: A Biography can certainly be described this way, but “cute” does fall rather short and probably would have irritated Woolf immensely. Flush is the tale of Elizabeth Barrett Browning’s dog, a cocker spaniel who was mentioned frequently in her letters and whom Barrett spoke of as though he were a person. It covers his entire life – from puppie-hood in the country to the long quiet years as Barrett’s sick-room companion, his initial animosity toward Robert Browning, his capture by dog snatchers and eventual recovery, and the happy free years in Italy before his sudden death. Woolf avoids the talking animal ploy, revealing Flush’s thoughts and feelings from an omniscient point of view (although, dare I say, not quite as well as Rosalind Belben did in Our Horses in Egypt). Overall the book is amusing and sweet, but in the excellent preface to my Persephone Books edition, Sally Beauman points out that there is much more going on. Noting the parallels between Elizabeth Barrett’s imprisonment by her father, Woolf’s own carefully monitored existence under the watchful eye of her husband, and of course the transformation of the wild and free animal into the sedate and adored lapdog, Beauman states: ‘It is this tension, between protection and confinement, between dependence and freedom that underpins Flush.’ Flush is quite a fascinating book, and certainly much more than just a cute story about a dog. 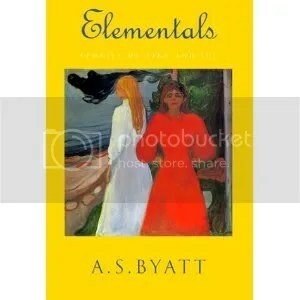 I just finished a collection of short stories by A. S. Byatt called Elementals: Stories of Fire and Ice. It was fantastic. Her writing is quite lovely, and I really enjoyed the mix of reality with elements of folk and fairy tales. Each tale dealt with some sort of tension between two intense emotions or situations, and Byatt deftly and lyrically built worlds and characters that I quickly identified with. My favorites from this collection are Crocodile Tears, and Cold. Having finally tried Byatt, I’ll definitely be seeking out more from her. And now, back to cleaning the house… Or perhaps I’ll call it good and settle down with Conversation in the Cathedral for a few hours, before CP and I go to watch the Bangor Symphony Orchestra perform this afternoon. I am eager to hear Beethoven’s Symphony No. 2 in person, and I am REALLY excited about hearing Variaciones Concertantes by Alberto Ginastera. It’s an Argentinean piece with Argentinean rhythms and melodies, but in an orchestral setting. I have never heard it before, but from the description it sounds amazing. We will also be going to dinner at a new place in Bangor – The Fiddlehead Restaurant. Should be a fun afternoon/evening. Hope everyone else is enjoying their Sunday! Sorry to hear that de Lint in the longer form (I have only read his short stories so far which I really think are great) was not totally up to your expectations. 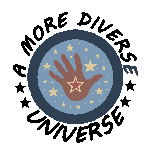 I like the sound of this one however because of the unorthodox mix of Celtic and Native American elements. I enjoyed Flush a lot when I read it. I remember the tactile descriptions which I found quite original. I need to have a look at those short stories by A.S.Byatt. I only read two very short novels by her so far and both were really good. The mix of Celtic and Native American elements was really neat, and I’m still curious about de Lint’s later work. His stories and novels set in Newford are supposed to be excellent. I’ve had a somewhat rare Sunday off, Sarah, and so have been reading Vargas Llosa and Proust but avoiding cleaning the house. Have to say that your description of Flush: A Bio makes me more interested in reading that than I’ve been before–although memories of my disastrous encounter with Woolf’s Orlando: A Bio are still too fresh for me to consider a whimsical new Woolf bio more than a year later. Bah! Haha, give yourself a few more years perhaps. It’s hard for me to guess what you would think of Flush but I would certainly be curious to find out!